This program gives you the ability to edit all LFS 0.6H cars and more ! A basic rims manager using the same online database as Pro Tweaker. We are currently preparing a new version of Pro Tweaker for LFS 0.6H. 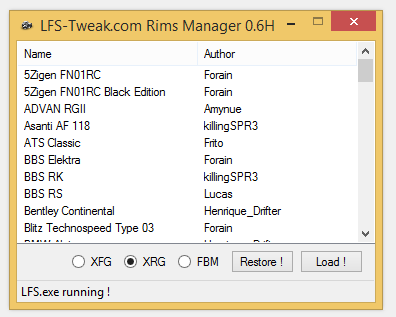 This program gives you the ability to edit all LFS 0.6G cars and more !